Weighty Matters: Performance Chocolate Bars? So apparently now Hershey's is marketing OhHenry! bars as performance enhancing. Their new bar, OhHenry! Pro is being promoted for both its protein content and its consequent great fit as a sports enhancement. Television commercials have folks eating OhHenry! Pro bars suddenly gaining great strength and agility and of course are aimed at teens with their music and content (skateboarding and cycling). So what is in this rocket propelled chocolate bar? 320 Calories, 21grams of fat (6grams saturated), 5 teaspoons of sugar and 12 grams of protein. 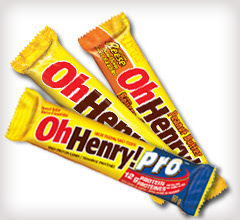 Or to put it differently, pretty much exactly the same stuff as is in a regular Oh Henry! bar just with double the protein. Protein won't make you fast. Calories will eventually make you slow. Hershey's marketers apparently lack scruples.